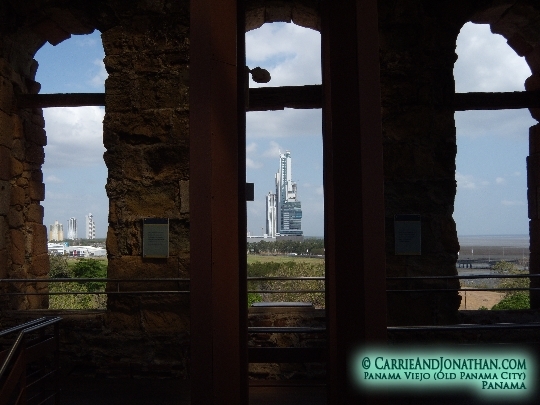 I don’t know why, but for some reason, I thought that Panama Viejo (old town Panama City) was Casco Viejo. I was wrong. This morning, Jonathan and I decided to go see Panama Viejo and then have lunch at one of the many new and fun places in Casco Viejo. 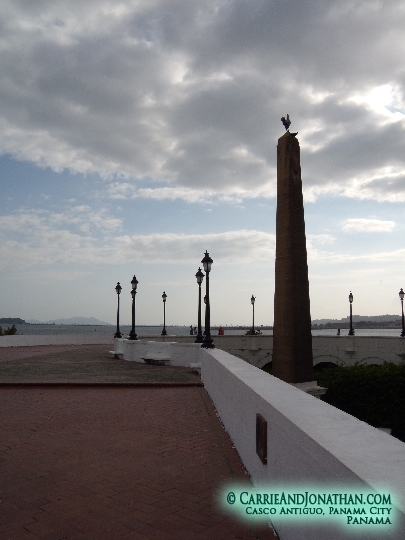 Casco Viejo is also called Antiguo Viejo, as you’ll see in the video below. We grabbed a taxi right out front of our hotel (Hotel Santana), and were taken to Panama Viejo. Our driver also told us where it was safe and where it wasn’t if we wanted to walk around the old city. 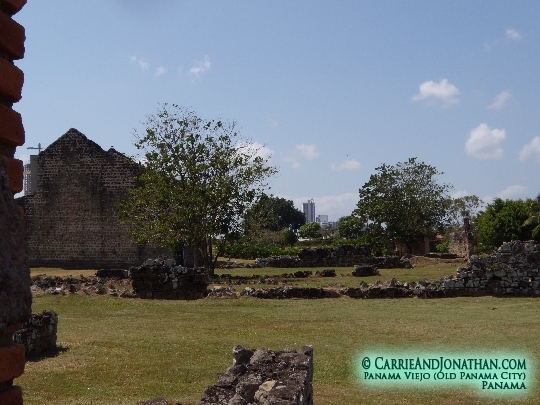 Panama Viejo is the ruins of the original Spanish settlement in Panama City. It was abandoned in 1671 after pirate attacks and fires destroyed it. They are currently working on restoring the ruins, and there are some pretty amazing places to see. 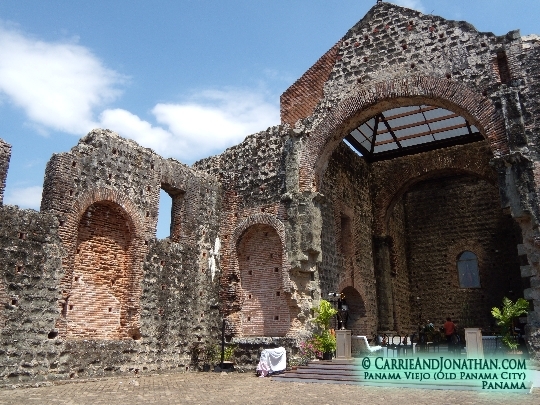 We saw the ruins of an old convent that was newly built when the city was destroyed. It also looked like they were setting up for a wedding reception. What a cool place! Then we walked to the tower. But, unlike London, city’s tower was used primarily as a church tower, with the added benefit of serving as a lookout for pirates. 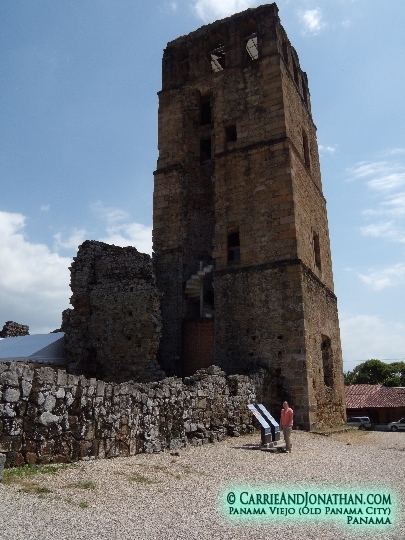 During the restoration process, they put a roof over the tower. But they wanted to make in invisible from the outside. So, the water drains go down through the staircase to the top. It was really amazing to get to look out the same windows, and see all the ships waiting to go through the canal and pretend they were pirates. Hello Pirates! 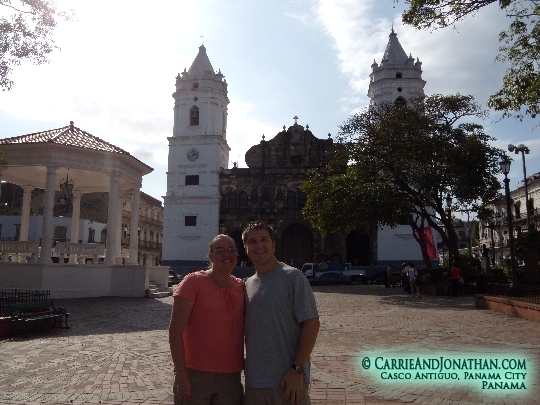 From there we realized that Panama Viejo and Casco Viejo were not the same thing. 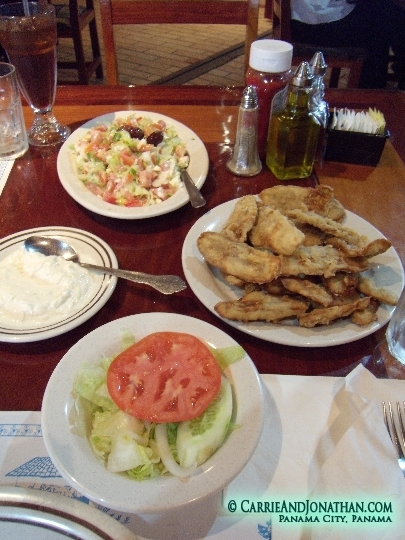 So, we asked a woman who was working at Panama Viejo for a good lunch recommendation. She suggested Restaurante Jimmy. So, all 3 of us grabbed a taxi together, and we went for lunch (dropping her at her destination along the way). I am so glad that we asked her where we should go, and that we listed to her! The food was amazing with lots and lots of options. It was delicious. I highly recommend that you try Restaurante Jimmy in San Francisco district of Panama City, Panama. Then we caught another taxi and asked to go to Casco Viejo. We stopped outside the National Cathedral. Then we walked along the water. We saw the ruins of a club that was right on the edge of the ocean. It looked like it was a pretty amazing place (before it was destroyed by the US during the 1989 invasion). We walked a little further and found a fun path that was covered with vines and flowers. We later learned that this path was built on the remnants of an old city wall. We did some more walking in the area, and then decided that it was time for ice cream. Panama City is hot. Hot hot hot. We saw a fun gelato place, so we stopped in there. They didn’t accept cards, and we were out of cash, so Jonathan asked where the nearest ATM was. The woman gave him directions and he was off. 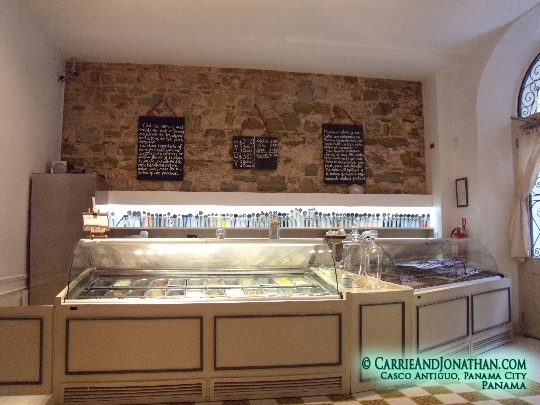 When he came back we enjoyed some lovely ice cream from Granclement. I really liked all the old ice cream scoops on the walls. Then we decided that we would walk back to our hotel. It didn’t seem too far, so we thought we’d give it a shot. It turns out that the ATM was further than the hotel! So, we had a nice little walk, even if it was one that I wouldn’t want to do after dark. They’re really working to get the neighborhood cleaned up. In a few years it is going to be prime tourist area. But right now, it’s a little on the sketchy side. When we got back to the hotel, we worked in the lobby for a little bit. We were able to make some new friends that way. We met and chatted quite a bit with Eric Goldschmidt, a pastor from Wisconson, and a Czech couple living in Portland, Or. Then it was off to bed, since the taxi was coming at 5:30am to take us to the airport. Yea, restaurant recommendations are fun! When I was in Puerto Vallarta for my first night Mexico, I asked about a good place for tacos in the area. I was told there was a tiny little place called “35×5” near the beach, but that it was only open after 5pm. Anways, 35pesos for 5 tacos! not even the tiny ones either. Fairly good sized, and delicious! Tacos… sounds yummy now. Thanks for coming to Panama Jesse! Was a blast in Boquete!